The fact that Gmail has an amazing search function isn't always the best thing. Sometimes this amazing search can get downright annoying. 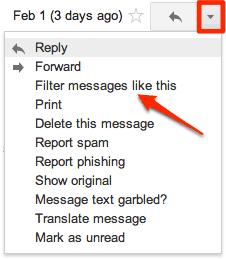 One of the original unique things about Gmail was that you had this Archive button. When you archived a message, it was whisked out of your inbox but would still be somewhere. That way it would show up in search results. Gmail's motto was “never delete another email”. To a large extent, this is an awesome system. I love not having to delete any personal correspondence- even mail with attachments stays in my archive. I've had my Gmail account for over 7 years now, so when I search for a keyword, I usually get too many messages back in result. Now, if I take my time and use Gmail search operators, I can usually get a better set of search results, but it always annoys me when I search in my email and the majority of results that come back are old list-serve newsletters, account notifications, etc. There are two ways to solve the problem. The first is by going back through your inbox and finding and deleting messages that you really don't need anymore. If you're good with those search operators, this isn't so bad. Yet, it's so… manual. 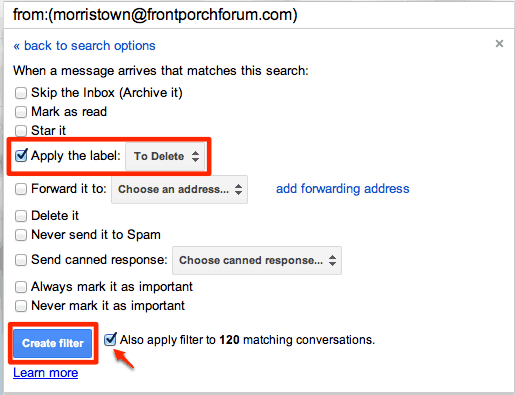 If you've been reading this blog for a little while, you know that I'm a huge fan of filters in Gmail. Heck, I even have my own training course on how to create an inbox that manages itself that relies mostly on filters. This is a new one that I just came up with. The way I see it, there are two kinds of email messages: temporary and permanent. The permanent messages you keep (and hopefully organize) for all time. The temporary messages- email newsletters, local list-serves and classifieds- you are only interested in reading for a short period of time. Temporary messages should get deleted later so they don't clog up your email search results. 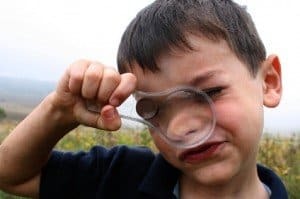 Ideally, you should already be filtering email newsletters and any recurring email you receive (if not, see the (free) email ninja kit). What I'm suggesting, is that you filter any temporary email so it all has the label To Delete applied. This way you can go back every month and just empty the To Delete label into the trash. Bam! You've just created the To Delete label and filtered one type of message to go there automatically. These messages will still show up in your inbox, but when you hit the Archive button, they will be labeled with To Delete. All you have to do in the future is empty the To Delete label into the trash every now and then. How do you deal with old messages? Like this post? Have a different way of doing things? Leave a comment and share your email wisdom!